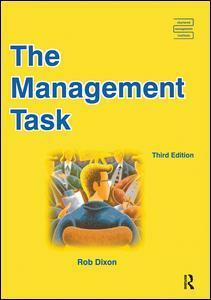 This book addresses the task of management in terms of the different processes involved , for example, planning, decision-making, organizing, communication, and the more specific management functions such as personnel, marketing and the environment of management and business. It covers the knowledge and understanding required as part of any competency-based management programme. This new edition has nearly doubled in length to cover the new areas of the CMI diploma syllabus and now includes two new sections on marketing and new management thinking. Introduction: What is the Management Task, Why is Management Important, The Development of Modern Management, The Management Process: Planning, The Planning Cycle, Management by Objectives, Decision Making, Organizing, Strategy, Leading, Motivating, Communicating, Control, Measuring Performance, Management Functions: Managers and Departmental Functions, Production, Marketing, Finance, Personnel, The Managerial Environment: The business environment, Conclusions. NVQ3, NVQ4, NVQ5 supervisory and first line management. CMI Diploma level Managing performance and Developing your management style. HND Business Organization courses.